Despite the technical name arpeggios are a really simple concept, provided you know a handful of chords. The idea is that instead of strumming a chord you play it one note at a time. The technique is used in all styles of guitar music, from classical and folk to rock and metal. So it doesn’t matter what you’re into - arpeggios are essential learning. Everybody Hurts by REM is a great example for any beginner to have a go at - for much of the verse you’ll be following easy open D and G chords before changing to Em and A. House Of The Rising Sun by The Animals is another good example, or, for some more advanced chords and rhythms, listen to Pink Floyd’s Us And Them or Metallica’s Nothing Else Matters. These are wildly different songs essentially using the same techniques. Start off by fretting a chord that you know. It doesn’t really matter which chord you choose - just pick one that you are comfortable playing. Give it a strum to make sure you’re playing it cleanly, then turn your attention to your pick. Your aim now is to play each string one after the other. So, for example, if you’re playing a D chord, play the four strings that form the chord. Good idea! Start by getting your picking hand in the right spot. If you can keep your picking movements small and controlled you’ll find those arpeggios much easier. Experiment with an all downstrokes approach or using down-up style ‘alternate’ picking. Have a look at our first tab example to see how you get on with an arpeggio using an A chord. Try out some other chords you know. In each case play the lowest note first (usually known as the ‘root’) then follow up with three more notes. Try letting the notes ring out together; this is easy - just keep holding down the chord. Also try cutting each note as soon as you reach the next - this approach is more commonly used in solos. 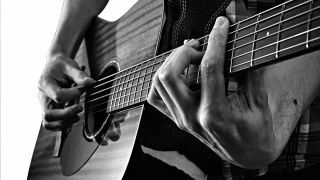 If your hand is in front of your guitar, you’ll have to move a greater distance to reach the string - guaranteed to hinder your progress with precise arpeggio movements. Gently rest your hand on your guitar’s bridge and your pick is automatically in position to pick any string with only minimal movement. Simply hold down the notes of an open A chord and pick the strings indicated in the tab one at a time. The notes should ring out over each other. Here we’re using a D chord for our arpeggio. This time, however, the notes shouldn’t ring out so relax your fretting finger after each note to mute the string.